At Coyuchi everything created is designed to comfort and rejuvenate—body, mind and spirit—to help you turn your home into a unique and personal sanctuary. Inspired by nature, we design products whose simple style is enriched by subtle textures, rich colors and refined details. The result is a sophisticated, relaxed and beautifully appointed home. At the exquisite detail and hand of this fabric. 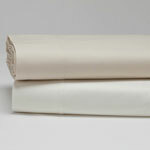 Coyuchi sheets are woven with 100% Organic cotton fibers. Certified by SKAL International to comply with the International Federation of Organic Agriculture Movements (IFOAM) standards. At the smoother feel of the 300 thread count. 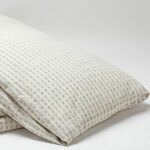 This fabric is made from 60's yarn as compared to our 220 thread count percale which is woven using 40's. Higher thread count fabrics are more tightly woven, are smoother and feel (even) better next to your skin. The exquisite detail and hand of these luxurious fabrics. 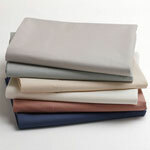 Percale refers to the type of fabric used in the manufacture. 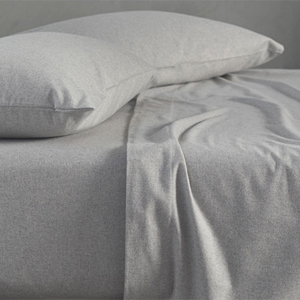 Often, the mistaken impression is "percale" refers to a blend of cotton and polyester, etc. This is not the case. Percale refers to the weave of the fabric, not its content. Coyuchi is the Mexican-Spanish name for naturally occurring brown cotton used for centuries by native people of the Americas. 100% Organic cotton, certified by SKAL to comply with the International Federation of Organic Agriculture Movements (IFOAM) standards. The first 100% organic cotton flannel on the market. Flannel is a warm fabric of various degrees of weight and fineness, usually made from loosely spun yarn.